CHAIRMAN: Ladies and gentlemen, the purpose of today’s sitting of the Tribunal is a twofold one; first of all to deal with certain matters pertaining to the Terms of Reference of the Tribunal, a large amount of which was dealt with in the course of the previous sitting. I will shortly proceed to deal with some brief matters of further interpretation of the Terms of Reference that have risen in of the course of correspondence with interested parties and I shall then invite any other submission or other matter that may wish to be addressed to the Tribunal in that regard. Having concluded that and having also invited any other applications for representation that may arise at this juncture, it would be my intention that we would then proceed to the other portion of today’s business which relates to certain proposed evidence which it is intended will be taken today and the basis upon which that evidence should be heard, that is to say whether it should be heard in public or, as has been proposed by the Tribunal, in private, having regard to its nature. However, the first matter that arises is that which relates to the Terms of Reference and as I have said, on foot of some further dealings in correspondence and otherwise, some limited and brief matters have arisen in addition to the aspects of construction that were dealt with by me at the last sitting. Firstly, I will address the notion of an association between Mr. Charles J. Haughey and a company as referred to in Terms of Reference (a) and between Mr. Michael Lowry and a company in Term of Reference (e). For ease of reference, I will refer to Term of Reference (a). Term of Reference (a) applies to payments satisfying a certain test of materiality. It applies to payments whether made directly or indirectly. Where a payment is made directly to Mr. Haughey, the fact that it is used to discharge a debt due by any company with which he was associated will not preclude the payment from otherwise coming within the ambit of the Terms of Reference. Likewise, where a payment is made indirectly to Mr. Haughey, the fact that any such payment is used to discharge a debt due by any company with which he was associated will not preclude it from otherwise coming within the ambit of the Terms of Reference. It is in that context that the notion of an association with a company must be interpreted. 2: The expressions, act or decision, found in Term of Reference (d) in relation to Mr. Charles J Haughey and Term of Reference (g) in relation to Mr. Michael Lowry, may sometimes mean the same thing but in general, act means the taking of action or the doing of something or the behaving in a particular way which may include omitting to act in another or alternative way. A decision may be the action or act of deciding something and hence the overlap mentioned above. More specifically, it includes the reaching of a conclusion or the coming to a resolution with respect of some question or issue as to what action should be taken or what position should be adopted in any particular set of circumstances. That concludes the amplification of the Terms of Reference on behalf of the Tribunal that arises at this juncture. I have already stated that our interpretation is not written in stone and we will of course either now or at any suitable future juncture permit submissions to be made and these will be fully considered and at this juncture, before passing onto the other aspect of today’s sitting, I should invite any submissions that may sought to be made in the context of the Terms of Reference and/or any applications that may at this juncture arise in the context of representation, either complete or partial, before the Tribunal. MR. CLARKE: Sir, I appear on the nomination of the Attorney General, together with Ms Emily Egan, seeking to represent before you, Sir, the public interest at this Tribunal. You may recollect, Sir, that on a previous occasion when the Tribunal was in session, it was indicated that the Attorney wished to reserve his position in relation to representation in the public interest. The Attorney has now formed the view that it would be appropriate to seek representation at this stage and I would so do. I would however indicate at this stage that the representation sought on behalf of the Attorney General in the public interest is a limited representation confined in general terms to three particular matters. The first are issues where a question of the constitution may be raised and the Attorney General as guardian of the public interest feels that it is appropriate for him to be involved independently of the Tribunal itself. The second is where a dispute may arise about the Terms of Reference of the Tribunal or the words of the resolution giving effect to the establishment of the Tribunal. And the third is a question where there may be a dispute relating to the powers of the Tribunal or the interpretation of the relevant legislation under which the Tribunal is to operate. In indicating those limited realms of involvement for counsel for the public interest, I would like to make it clear, lest there be any confusion on the matter, that it is our view that it is not appropriate for the public interest to be involved in the facts into which the Tribunal has to inquire in themselves. The primary role for investigating the facts and where relevant facts are discovered, laying them in public before the Tribunal rests upon the Tribunal and its own legal team. Firstly, that if you were disposed to grant the limited representation which I seek, you might arrange that counsel for the Tribunal would keep in regular contact with counsel for the public interest so as where possible to identify any issues that come within those parameters that may be likely to come before the Tribunal so that we can arrange for attendance to occur in advance. And secondly, if despite having attempted to today them in advance, something arises unbeknownst, that the matter or at least that aspect of the matter, might be adjourned until such time as the public interest can be represented to deal with it. I feel that the latter shouldn’t in any significant way interfere with the smooth running of the Tribunal and there clearly would be a very significant saving in the public expense of being represented if it can be confined to occasions when there is a real and legitimate public interest involved. So my application is for limited representation on that basis and while I am on my feet, Sir, it would appear clear that an issue that comes within those parameters and in particular the third of them, may well arise in the very near future this morning, concerning the question of the Tribunal hearing evidence in private. That is intimately concerned with the powers of the Tribunal and the interpretation of the relevant legislation and constitutional rights and I might just indicate at this stage, Sir, whenever you consider it appropriate, I would have some brief submissions to make in the public interest, not so much directed towards what your decision should be, but as to the principles that should be applied in coming to such a decision. Clearly I am not fully aware of all the circumstances that are known to the Tribunal and its team and I don’t necessarily want to be so aware where it’s not proper for me to be aware, but as this appears to be the first occasion where such an order may have been made, concerning in recent times, I think it would be appropriate to hear some brief submissions on how it should be gone about. CHAIRMAN: At this particular juncture, Mr. Clarke, you have no submissions as regards Terms of Reference? MR. CLARKE: None in relation to Terms of Reference. CHAIRMAN: Well I anticipate the other matter will be one that will rather promptly proceed to. Thank you very much for your attendance, Mr. Clarke. I have certainly formed the clear view that your application is an appropriate one, and having regard to the overall nature of the Tribunal and indeed to the remarks made at the initial sitting on the 31st October of last year and I am in no doubt that I should accede to your request for limited representation, noting the three types of situations in which you envisage that limited representation should become operative. And I note the limitations that you propose to place on that representation, both having regard to the nature of factual matters that may ensue at public sittings and indeed to the fiscal consequences of full-time representations being maintained by the public interests at all stages and I accordingly accede to the application on the basis that you have made it and equally, it seems to me, proper and sensible that the two proposals that you made be acceded to, namely, that there should be a liaison between the respective legal advisors to the Tribunal and to the public interest as regards contingencies that may require the public interest to be heard and secondly, that if in the course of sittings or other business of the Tribunal, some rather sudden contingency arising that may require the public interest to be heard, then it may be also my view that a deferral on any finalisation of orders should be provided for until such time as you have been able to make such contribution as you think appropriate. Very good. Are there any other matters of representation or any submissions that may sought to be made at this juncture on matters specifically connected with the Terms of Reference? MR. McGONIGAL: I suppose I should indicate in relation to the Terms of Reference I am going to adopt the suggestion which you have indicated and reserve our position should it arise at a later stage. CHAIRMAN: Just for the record, Mr. McGonigal, Mr. Gardner at the last sitting did mention that — that he was led by you for Mr. Charles Haughey and it remains the situation, Mr. McGonigal, that you are seeking to reserve your position which I appreciate and accede to, but that you are not formally making an application for either full or limited representation at this juncture. CHAIRMAN: Very good. With there being no other matters that arise in relation to the Terms of Reference today, ladies and gentlemen, that brings us to the other aspect of today’s sitting, with a view to expediting and finalising the preliminary work of the Tribunal, so that we may proceed to public sittings at the earliest feasible vantage point. It has appeared to the Tribunal that it will be necessary to obtain certain factual material in relation to matters of a banking nature. This particularly relates to the type of accounts that have been referred to in Mr. Justice McCracken’s Tribunal and in other sources as the Ansbacher accounts and to certain associated accounts. It is anticipated by the Tribunal that for the discharge of its business, it will be necessary to obtain certain information regarding the identities of persons, legal or natural, if any, who may have held accounts of that nature and that certain material relating to such accounts will likewise require to be ascertained by the Tribunal with a view to procuring that necessary information, certain important matters arise in the first instance. This course of action is likely to involve the disclosure of a considerable amount of information relating to the banking accounts or affairs of a number of persons, some of whom may eventually become involved in the public sittings of the Tribunal and some of whom may not. As the disclosure of that information is likely to involve the revelation of information concerning the banking accounts of such persons, it appears to the Tribunal that those persons will require to be put on notice of any request for the production of confidential documents and of any request for information concerning what may be confidential material related to those banking affairs. In order to identify those persons and to ensure that they are afforded the constitutional protection to which, in the light of the content of the Supreme Court decision in the case of Haughey and Others -v- Moriarty and Others, they are entitled. The Tribunal has taken the view that it is necessary to obtain the evidence of certain witnesses of a banking nature on oath. It is at present the view of the Tribunal that the sittings of the Tribunal convened to hear such evidence should be heard on the basis of the exclusion of the public pursuant to the appropriate statutory provision having regard to the likely nature of the evidence involved in the interests of protecting the rights of persons whose names may be mentioned. It is in that context, ladies and gentlemen, that the advertisements has been delivered in relation to today’s sitting and I am now inviting any submissions or other matters that may be placed before me in the context of finalising the basis upon which today’s intended evidence may be heard. Are there any other matters, Mr. Coughlan, as counsel for the Tribunal? MR. COUGHLAN: Not at this stage. MR. CLARKE: May it please you, Sir. As I indicated a view moments ago, there are some, I suppose one might call observations that I would wish to address at the moment in relation to the question of whether and to what extent the Tribunal might consider it appropriate to take evidence in private. Before making those observations, I do want to make it clear, Sir, that I have very deliberately refrained from seeking any private communication from the Tribunal or its team concerning circumstances relating to the proposed hearing that are not matters that will be canvassed in public in any event. I wished it to be clear that this could not be dealt with on any, as it were, private basis, whereon the basis of information that would not be publicly available, I, or indeed the Attorney General, might be satisfied of matters that the public wouldn’t know about. So my only sources of information, as it were, are matters which are already in the public domain, either through the proceedings of this Tribunal, the proceedings before Mr. Justice McCracken and the notice which was published giving a notice of the intention to have this sitting. Sir, it seems to me that perhaps the most important matter that needs to be identified at this sitting in public is the view of the Tribunal as to the stage of its proceedings that it is currently involved with and will be involved with when it seeks to lead the evidence referred to. As you will be aware, Sir, in the course of the judgement of the Supreme Court in the proceedings brought by Mr. Haughey, the Court, in the judgement of the Chief Justice, identified five stages through which a tribunal of inquiry of this type would go and it’s perhaps appropriate to identify them at this stage. The first is a preliminary investigation of the evidence available. The second is a determination by the Tribunal of what it considers to be evidence relevant to the matters into which it is obliged to inquire. The third is the service of such evidence, that being relevant evidence, on persons likely to be affected thereby. The fourth is the public hearing of witnesses in regard to such evidence and to the cross-examination of such witnesses by or on behalf of persons affected thereby. And the fifth is the preparation of a report and making of representations based on the facts established at such public hearing. Now I think we would have to accept that where the Chief Justice identified public hearing in both items four and five, that was subject to the possibility that even at that stage under the Act, in extreme circumstances, there might be a possibility of evidence being taken in private if it were necessary in the public interest. But the obtaining of information, whether it be evidence or otherwise, would appear to arise at two different possible stages in that process, which I might identify as stage one and stage four, stage one being the preliminary investigation of the evidence available and stage four being the public hearing of witnesses in regard to such evidence and the cross-examination of such witnesses on behalf of any persons affected. It seems to me, Sir, that very different considerations apply to a decision to hear matters in private depending on whether one is at stage one or at stage four. It seems clear from the judgement of the Chief Justice that the Supreme Court are of the view that the public were not entitled to be present at stage one. It would appear, however, that at stage four, the public are entitled to be present unless a very heavy weight of onus is discharged to establish that the public interest leans against that evidence being taken in public. Now the information that is publicly available as to the inquiry that the Tribunal will be involved with today simply suggests that there will be evidence taken on oath from certain witnesses concerning the identities of persons connected with various financial transactions and bank accounts. It is not clear at this stage whether it is intended that that be evidence in the sense of evidence which might form part of the Tribunal’s determination or whether it is simply part of the preliminary investigation process which, for whatever reason which might be indicated, is being conducted on oath. CHAIRMAN: Even without hearing Mr. Coughlan or any other parties, Mr. Clarke, I must say that I would instinctively somewhat recoil from a proposition that I would be entitled to report on matters heard in private without interested parties and the public having a chance to be present and to challenge that evidence or adduce rebuttal if they see fit. MR. CLARKE: That would undoubtedly infringe the rules of constitutional justice. If it be the case that the sole purpose of what is intended today be that matters be identified to determine whether they are relevant or to set in train a process which might determine whether they are relevant to the Tribunal’s inquiry, and if it then be the case that assuming they be relevant, they would be led in public in the ordinary way in the fullness of time and if they be irrelevant, then obviously nothing turns upon them and there is no need for them to be led in public. Then it would seem me that that would come within category one but I think it would be important that it be clarified that there would be no question of the Tribunal not subsequently leading in public any material which may be revealed at today’s sitting which turns out to be relevant to its deliberations and which it, as it were, passes the stage two test of being evidence relevant to the matters into which it is obliged to inquire. In that regard, it would also be relevant to know whether it would be intended that other parties, that’s to say other than the witness and perhaps the advisors of the witness, would be present and entitled to cross-examine today or would that again be deferred so that a party would subsequently be entitled to hear that evidence in public and if they feel appropriate to cross-examine. Certainly if that were not the case, if the witness were to be taken, as it were, in private, solely with the Tribunal and its own — and the witness’ own representatives present, then that would have much more the character of a stage one investigation than the hearing of evidence. The only concern I would have would be if there were to be evidence in the sense of that word which means matters that might be relied on by the Tribunal as part of its deliberations, if there were going to be heard in public — sorry, other than in public, then very different considerations might well apply and I might well have a strenuous application to make concerning whether it be heard in public. But perhaps it might be appropriate at this stage if either the Tribunal or its legal team might clarify, as it were, the mechanics that were intended so as to help identify whether this comes within stage one or stage four, in that if it’s clearly within stage one, there is no need for us to enter into a more complex debate about the appropriate principles to be applied for a private hearing at the stage four part of the Tribunal’s inquiries. CHAIRMAN: Thank you, Mr. Clarke. Before I invite any reply from counsel for the Tribunal, are there any other submissions on this aspect that arise at this juncture? MR. McGONIGAL: As I understand it, and I am not to take Mr. Coughlan’s ground, this is part of the Tribunal’s preliminary investigation for the purpose of gathering evidence and at this stage, not only will the public be excluded but also as I understand it, it is not anticipated that any of the persons present before the Tribunal other than the witness and the people directly connected with him would be present and it is on such a basis that I accept that it is a matter for the Tribunal that it should be in private. CHAIRMAN: Thank you, Mr. McGonigal. MR. COUGHLAN: First of all I am in a position of offering advice to you, Sir. Just a few matters which Mr. Clarke raised when he initially sought representation and indicated that this is probably the first time that this type of procedure was to be adopted by a tribunal of inquiry. I think he did say in fairness in recent times. 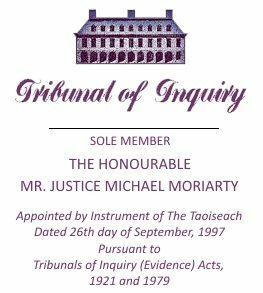 Of course such a procedure was adopted, although the stages of a — the conduct of a tribunal of inquiry had not been enunciated so clearly as they have been by the Supreme Court in the recent case of Haughey and Others -v- Moriarty and Others. But it was a procedure which was adopted in the inquiry conducted into the dealings in the Great Southern Railway stocks between the 1st January 1943 and the 18th November 1943. I think, Sir, you indicated before Mr. Clarke made his submissions not in any way to contradict or call into question the function of the Tribunal at this stage, but to set out principles which you said were applicable principles, you did indicate that this was part of the preliminary work of the Tribunal and I don’t think there has been any suggestion otherwise than that it falls into that category and therefore, it would be what Mr. Clarke describes as stage one, or category one as enunciated by the Supreme Court. In that regard, the views expressed by My Friend, Mr. McGonigal, are of course the views which have been expressed by you, Sir, by indicating this was the preliminary stage and that only the witness from whom evidence was being taken at this stage and his or her legal advisors would be present for that purpose. CHAIRMAN: Is it necessary or desirable at this public portion of the sitting, at any rate, Mr. Coughlan, that it be intimated to the public that any further details be given on the witnesses or witness proposed to be questioned? MR. COUGHLAN: No, Sir, I would say that as it is in that preliminary stage of the Tribunal’s work, even the identity of the witnesses should not be indicated at this stage in that they may or may not be relevant to the public phase of the Tribunal’s work at a later stage. The Tribunal doesn’t know that yet. And in those circumstances, my respectful advice would be that even the identity of the witnesses would not be indicated at this stage. CHAIRMAN: Very good, gentlemen. It seems clear that I am in a position to rule quickly on this matter, having regard to what has been stated by Mr. Clarke, by Mr. McGonigal, and by Mr. Coughlan. I do propose to accede to the statutory entitlement to exclude the public for the remaining portion of today’s evidence, having regard to the nature of the evidence that is intended to be led but I do so explicitly upon the basis that it relates only to what has been accurately described by Mr. Clarke pursuant to the Supreme Court judgement as phase number one of the five phases of a tribunal’s inquiry work. Indeed if it were to transpire in the course of the resumed hearing later today that material that more properly seemed appropriate to latter stages were to be embarked upon, I should see it as incumbent upon me as the sole member of the Tribunal to ensure that only matters that pertain to stage one are dealt with. And having already, in the course of the brief discussion with Mr. Clarke, intimated my own view on the matter, I expressly confine the exclusion of the public for today’s sitting and any resumed or further sitting that may be necessary in the same category to matters coming within this first phase only and I confirm that there will be all the safeguards that have been set forth in the Supreme Court judgement of the Tribunal promptly assessing all the matters that have been placed before it from its preliminary phase, deciding those that are relevant to the eventual public sittings and those not so. And then furnishing all material information upon interested parties in relation to the public sittings to be then pursued. So accordingly, I rule that the public should be excluded from the remainder of today’s session and for any adjourned session that in the very near future may have to be held to conclude the business that was set forth in the adjournment. I make this ruling reluctantly because I am conscious that the generic nature of this business is that it is a public inquiry and I do so only because of the specific and special circumstances that have arisen in relation to the nature of the business and in relation to the safeguards that the Supreme Court have directed must be observed in relation to the privacy of certain potentially interested persons. Very good, ladies and gentlemen, I propose then that we resume on the basis of only the limited attendance that has been indicated in as near as possible to ten minutes’ time. THE TRIBUNAL THEN ADJOURNED TO PRIVATE SESSION.